Pretty Me Up! : Dashing Diva's Halloween Designs Nails On The Go!! Dashing Diva's Halloween Designs Nails On The Go!! Dashing Diva introduces new Halloween themed Design Nails on the Go, fun pre-glued press-on nails for the spooky holiday festivities. They can last for up to two days of wear. To remove, simply soak nails in warm water and remove - no damage is done to the natural nails. • No messy polish or drying time. • Fun & trendy - Designs for the fun-loving, trend-setter. 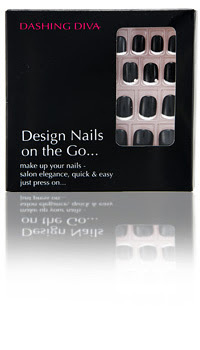 • Quick & easy - Adhesive is already on the nails. Find the correct sized nail, press-on and go! • No damage done to the natural nails. French Manicure goes black with a dark Diva attitude. Just press on go! Ditch the icky nail glue for a quick chic polished look whether you go French tipped or vamp glossed. Nail application lasts up to 2 days. Adhesive comes pre-applied on nails. Soak in warm water to remove. Kit contains: 28 preglued nails, 1 manicure stick, 1 nail prep. 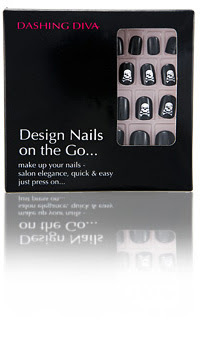 Midnight black nails are accented with skull ‘n bones, and a rhinestone studded eye. Sweet! Those are nice ones! And they look great on you!! I love how the one eye on the skull is a rhinestone! LOL! OMG Sweeeet! These look so good! Even if not for Halloween they'd be great to wear!